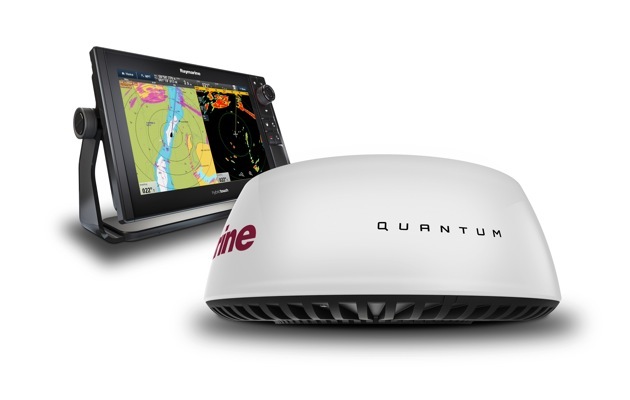 The ‘Raymarine Quantum Wireless Chirp’ was launched at the London Boatshow on 8 January – a radome claimed to be the lightest and most efficient radar in its class. Multiple benefits are claimed, but the weight-saving potential alone makes this an impressive advancement for sailors. Chirp technology is used increasingly by marine manufacturers in echosounders to increase target resolution when fishfinding. The same benefits are applied to marine radar with the launch of the Raymarine Quantum, the industry’s first compact recreational radome with Chirp pulse compression technology. The Raymarine Quantum uses pulse compression to produce sharper, more defined images by sending out variable frequencies simultaneously. Yes but why is this radar particularly interesting to sailors? Aside from optimum target resolution, the potential weight-saving benefits aloft are appealing. The 18in Quantum weighs around 50 per cent less than traditional magnetron radars. 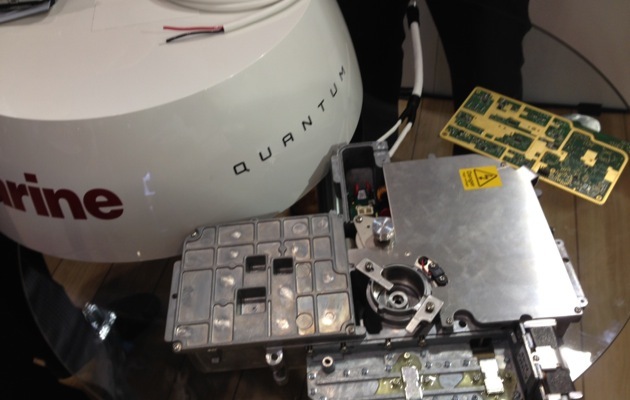 At its world launch of Quantum, Raymarine showed the new solid-state circuit board and compared it to the metallic innards of a magnetron radar (pictured above). This comparison helps bypass the marketing hype to make the reduction in size and weight tangible. The Quantum radome weighs just 5.6kg – around 2kg lighter than the competition – practical weight-saving when mast-mounted. In essence, although there is still a spinning part inside the radome (the circuit board), it is the information produced to send out the radar pulse that has changed. The promised range is another benefit of this technology – up to 24nm, but also down to just 18ft away. “It has much better close range resolution but without the worry of big bang echoes,” Raymarine’s Head of Corporate Marketing Fiona Pankhurst told me. Integrated wifi allows Raymarine’s Quantum to network directly to multifunction displays, and simplifies installation by eliminating the need for additional radar cabling. It also benefits from safe emissions and minimal warm-up time as per Broadband types. Pankhurst says the benefit over these radars is that their Chirp model won’t suffer any interference from magnetron radar echoes. The physical size of the radome is still very similar to past models, hence its installation footprint remains the same. And at £1,495 inc VAT, there is no cost increase over past models.